Gutter guards are the best way to protect your new gutter system at your home in Bernalillo, New Mexico, or a surrounding area. For the best selection of gutter covers available to homeowners in the area, turn to ABC Seamless of Albuquerque. Our gutter protection products can prevent you from future troubles at your home including blockages, leaks, cracks, and overflowing water. Our gutter guards are specifically designed to fit our seamless steel gutters to provide you with even more protection against the elements. When you pair your gutters with a cover you will be able to keep out unwanted airborne debris such as pine needles, leaves, or tree nuts. 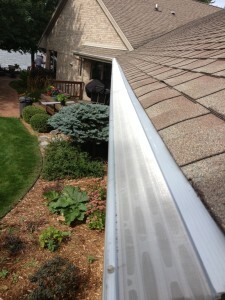 Also, with gutter covers installed you will be able to keep out unwanted pests and insects. For more information about the gutter guards available to residents of Bernalillo, NM, and the surrounding areas, contact ABC Seamless of Albuquerque today. A knowledgeable member of our team will happily answer any questions you may have and schedule you a complimentary consultation. Make sure to ask about our financing options available to those who qualify.